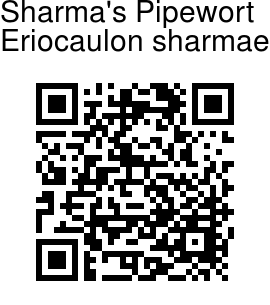 Sharma's Pipewort is a small semi-aquatic annual herb, 20-30 cm tall. Lance-shaped blunt leaves are 20-25 cm long, and 2.5 cm wide at the base. 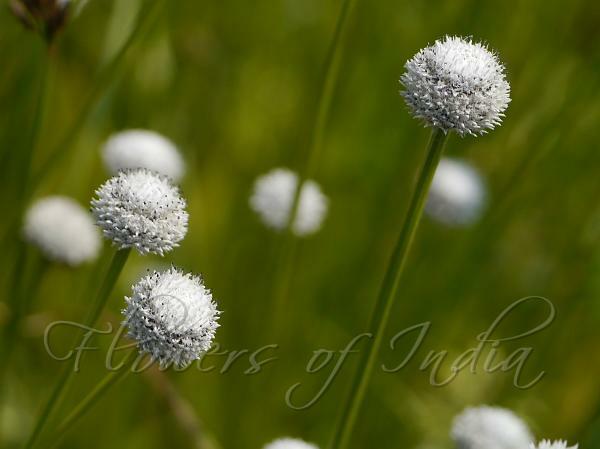 White flower-heads are born on stout twisted stalks 20-30 cm tall. Leaf sheaths are 8-10 cm, obliquely split. The bracts below the flowers are broadly obovate, longer than flowers. This plant is rare in lakes and ponds on Sahyadri hills. Flowering: September-October. Identification credit: Dinesh Valke, Shrikant Ingalhalikar Photographed at Amboli, Maharashtra.